If you build a site and no one sees it—then what’s the point? Melbourne, FL | November 19, 2018 – UCF Alums Eric Needle (Class of ’89), and son Ryan Needle ’18, recognizing the growing need for fast, efficient, modern websites—have launched GreenDev, a studio dedicated to designing, building, and promoting websites that work. The world of web design and development is always changing. We find that sites built even a few years ago are no longer effective. They require time and energy to maintain, they’re not secure, and most importantly, they don’t reach your audience as they used to. Eric and Ryan face this challenge head-on with a different approach; Design needs to drive attention, content needs to be concise and it all needs to come together so that the user does something when they visit your page. A site needs to convert casual visitors into active participants, to be effective. Being found in search, optimizing your site for paid advertising and engaging users when they visit can never be an afterthought—it’s why you hired us. If you build a site and no one sees it, then what’s the point? Their mantra of Design, Build, and Promote is what makes GreenDev different. Most developers leave off the third step. Promotion is what’s missing from your digital marketing. Just building a pretty site is no longer acceptable. Sites that perform—that get your audience motivated—is the goal, and anything less is a waste of effort. Eric earned a Bachelor of Fine Arts in studio arts. He’s a mentor in the College of Art and Humanities’ Alumni Mentorship Program, UCF’s newest initiative to expand their network, and strengthen the professional experience of CAH students. Ryan just graduated in 2018 with a Bachelor of Arts in English. He works at GreenDev and Longbow, managing content creation and copywriting. Based in Melbourne, FL, their company has hosted five interns from FIT, Melbourne’s private technical university, in their marketing department’s Practicum program that awards three credit hours. 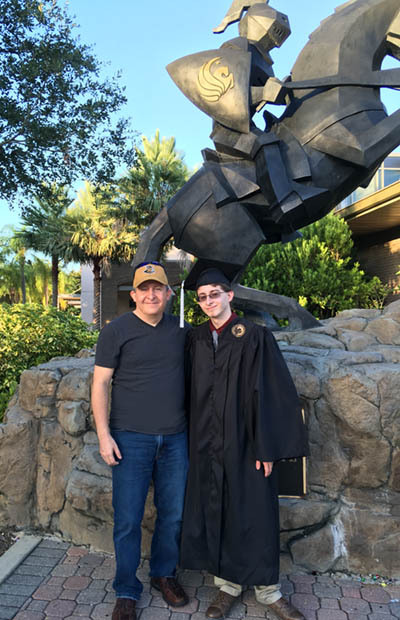 By connecting alumni with the next generation of Knights, UCF adds tremendous value to creative degrees. Working with GreenDev helps students build portfolio, using diverse skill sets that include design, development, creative writing and copywriting. GreenDev’s connection to UCF gives us a unique opportunity to work directly with one of the largest networks in the nation. And with affinity for fellow Knights, we know that helping students and grads now—translates into future networking. It allows us to build up, partner with, and teach knights about the ever-changing online professional world. Why do we do this? It’s fitting that we release this news on Thanksgiving. We’re thankful for all the people who have helped, mentored and partnered with us over the years—and try and return that energy by mentoring and hosting interns. GreenDev excels at branding and design, giving your site a focused message and clean corporate image. We design to be clear and concise, while guiding viewers to your products and services. With the vast array of tools and programs available, anyone can build a website, but a website will accomplish little, if no one can find you online. To be effective, your sites needs to perform in Search, be optimized for Paid Advertising, be full of rich, relevant Content, and create a two-way communication via Social Media. In the background, Analytics must be in place to measure and show progress. These components are often overlooked as extras, but we know they are mission critical. GreenDev understands why we build sites. The age of pretty brochures is long gone and sites that don’t reach the right people limit your growth. With so much competition, it’s too easy to get lost in the noise. When you don’t plan for conversion, you impair effectiveness and visibility. GreenDev is collaborative, always looking for people who want to work together and build something special. Students and Alum who partner with GreenDev, can boost resumes with real, timely experience. Connecting with other Knights is a perfect way to build your career and aim for the stars. Both Ryan and Eric are proud of their school and eager to be life-long partners in its future. #GoKnights! Longbow, our parent company provides all the services of an advertising and public relations agency, focused on brand, content and digital marketing. GreenDev is a new brand we created to focus on web.